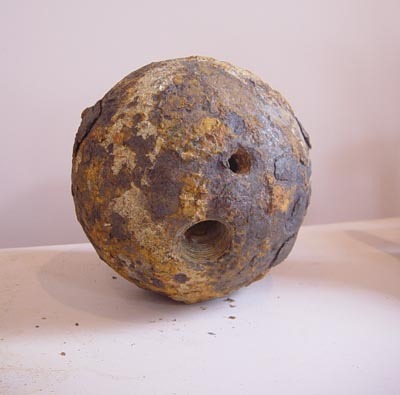 In 1998 a 24-pound cannon ball (known as a shrapnel shell) was recovered by road workers on Middleton Road, near where the wagon load of artillery had crashed. It is now in the possession of the Onslow Historic Society based at Ngaio, Wellington. 24 pounder shrapnel shells were fired from 24 pounder howitzers and 24 pounder Coehorn Mortars, not from long guns. These illustrations for the historic society by W Fraser, describe the interior of the ball. Mr M.S. Evans, Assistant Curator of Weapons & Ammunition at the National Army Museum at Waiouru, explains this further. 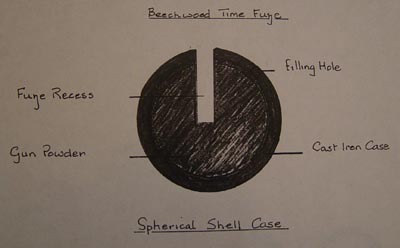 "I have attached [a diagram] of the 'Shrapnel' shell. A 24 Pr shell would be approx 141mm in diameter and from the photo on your site the one recovered in 1998 could be a Shrapnel." "The cannon, being Smooth Bore, Muzzle Loading (SBML) was as the name suggests loaded from the front. A pre-prepared propelling charge of a set weight of gunpowder in a cloth bag was pushed down the barrel. This was followed by the shell that had been previously prepared by filling and fuzing. 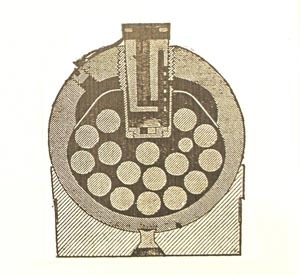 The shell went in fuze first so that the flash from the gunpowder propelling charge would light the slow burning gunpowder core in the Boxer fuze. A small quantity of fine gunpowder was then poured into a small hole at the back of the cannon. When this was lit it would ignite the gunpowder in the barrel." "After flying through the air the slow burning gunpowder would flash through the side of the fuze through a hole made just before it was fitted to the shell. This would ignite the main gunpowder filling in the shell and either make it explode (Common shell) or burst in the air firing the lead balls like bullets (Shrapnel shell)." "The shell were prepared by filling with a set weight of gunpowder. The distance to the target was then estimated and the time of flight to that target calculated (in seconds). 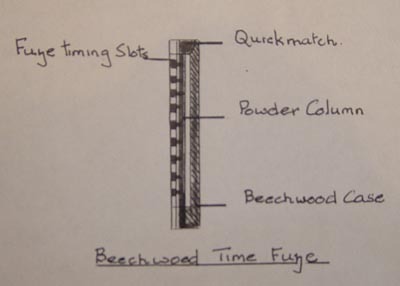 A wooden Boxer fuze was then taken and a small hole pricked in the side at the selected time marking. The fuze was then inserted into the shell and given a twist to lock it into the threads. Just before the shell was loaded into the cannon the cardboard or cloth cap or cover was removed from the top of the fuze to expose the paper covered slow burning gunpowder core." "The recovered shell has no fuze and the smaller hole (possibly the filling plug hole) is also empty. This would indicate a probable Shrapnel shell as it would be transported. It would have had the shrapnel balls already inserted but no gunpowder charge. Some Common shells also had filling holes, but the same would apply." Mr Evans said a '24 pounder' referred to the weight of the shell that was fired from the cannon. It was usual for the migrant ships to sail quite heavily armed. He said a commercial ship would often have about a dozen cannons. The next section in this article researches the origins of the cannons.